Here are direct ways to get Territorial Army Officer Admit Card. Go under “Notifications” section at home page. 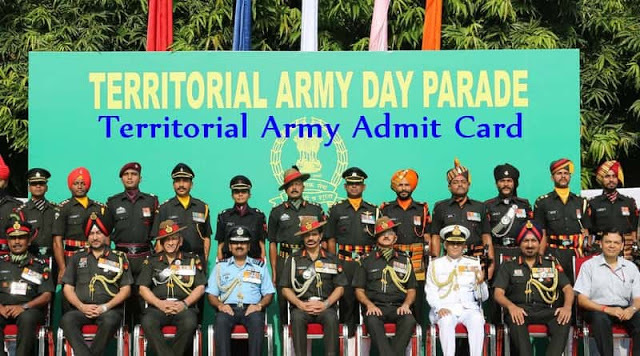 From various links, you need to select appropriate about Indian Army Territorial officer admit card. Wait for few seconds, your Indian Army Hall Ticket will open up. Just enter your Username, password and captcha as per requirements in the empty box provided in front of the asked details. Now press on the “Login” button. Check the details present in your admit card. At last obtain a print out of Territorial Army Exam Admit Card for further need. Indian Army Exam Pattern will help you to know about distribution of marks. You have to obtain minimum 40%marks in each paper separately and have an taken as a whole 50% to qualify it. Written exam will be organized at below given centres. Have a look!! Chandigarh PIB Cell, TA Group Headquarters, Western Command, Building No. 750, Sector-8B, Chandigarh-160009. Kolkata, Shillong PIB Cell, TA Group Headquarters, Eastern Command, Fort William, Kolkata (WB)-700021. Lucknow and Patna PIB Cell, TA Group Headquarters, Central Command, Lucknow (UP)- 226002. Jaipur, Pune, Bengaluru, Hyderabad PIB Cell, TA Group Headquarters, Southern Command, Pune-411001. Preliminary Interview Board (PIB) will conduct Interview after written test so as to enroll proficient aspirants for Territorial Army Vacancy. Territorial Army Group Headquarters will organize this procedure. Candidates have to produce all required documents and testimonials at the time of Interview. Those who get qualified under written exam and interview have to appear for tests at a Service Selection Board (SSB) and Medical Board for the intention of final selection. Ensure these details to be printed on Indian Army Hall Ticket. All information placed above will guide you in downloading Territorial Army Admit Card 2017–2018. Go through its Official Link to know more about it.